Residents have lost faith in the system, but they are also ready to fight. Families in Flint, Michigan, are facing a man-made tragedy. Their water is making them sick. This happened because the state government ripped democratic rights away from residents and tried to run government like a business. The state government made decisions in the name of “fiscal responsibility,” but when it comes to people’s health and well-being, the government should not cut corners and operate on the cheap. The government provides services and protects the people. Businesses make a profit even if that means laying off employees and cutting costs. The government should not seek profit, but rather the protection of those it represents. But when Governor Rick Snyder signed an emergency manager law, he made it possible for a single, unelected official to cut services, strip regulations, and gut local governments, all without being voted into office or held accountable by the people. Then, a flawed strategy to save a little money on water—even when it poisoned children—caused a crisis. But despite the public’s trust in government being broken and their will being tested, the people of Flint are refusing to give up. They are more determined than ever to get justice. We must stand with them. Earlier this month, I traveled to Flint with 25 of my colleagues in the House of Representatives, including minority leader Nancy Pelosi. Our goal was to meet with residents and hear their stories so we could return to Washington, DC, and demand federal action. We held a “Speak Out” where families and residents of Flint were able to share their stories. For two-and-a-half hours, 26 members of Congress sat and listened as nearly 200 residents shared their stories and called for action. One woman spoke about the loss of dignity felt while waiting in line for water. Another spoke about how her daughter had developed a rash, like many children in Flint, and was unable to get treatment because Medicaid does not cover dermatology costs. At one point, her daughter asked if she was going to die. A local union representative called for investment in infrastructure, and for Flint residents to be hired to build it. 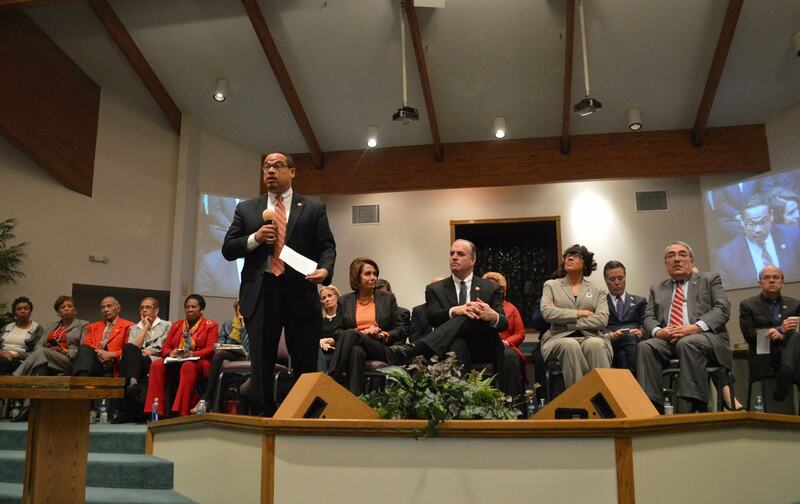 It is time to rebuild, and the residents of Flint are ready to work. Many were angry and felt betrayed. For 18 months, the people of Flint had been drinking lead-contaminated water. They knew something wasn’t right the entire time, and they were ignored. A number of the people who spoke openly wondered if there were any other contaminants in their water. Their stories will stay with me for the rest of my life, and so will their strength. What they said highlights the need for public investment—whether it’s investing in replacing old water pipes or taking the necessary steps to properly treat and protect our drinking water. It would have cost only $100 a day to treat Flint’s water with orthophosphate, an anticorrosive agent that could have prevented this crisis. Our crumbling infrastructure is a danger to the American public and must be updated. The Congressional Progressive Caucus recently unveiled its federal budget, which includes $1 trillion to repair not just our roads and bridges, but also our water infrastructure. The CPC budget also includes Representative Dan Kildee’s $765 million request for Flint, so the city can replace corroded pipelines and provide health and education services to its residents. The people of Flint are resilient, and by repairing the water delivery system and making the proper investments in nutrition and education, families in Flint can live healthy, successful lives. And by investing in infrastructure across the country, we can prevent future crises like this from happening again. The people of Flint have not given up, and we can’t give up either. They have demanded action. It is the job of elected officials to deliver. The 26 members who went to Flint, and many more, are ready to act. Rep. Keith EllisonRep. Keith Ellison represents the 5th District of Minnesota in the United States House of Representatives and Co-Chairs the Congressional Progressive Caucus.